Last year, over 500 people from 76 different churches joined together for 2 weeks of 24/7 prayer for Hamilton. 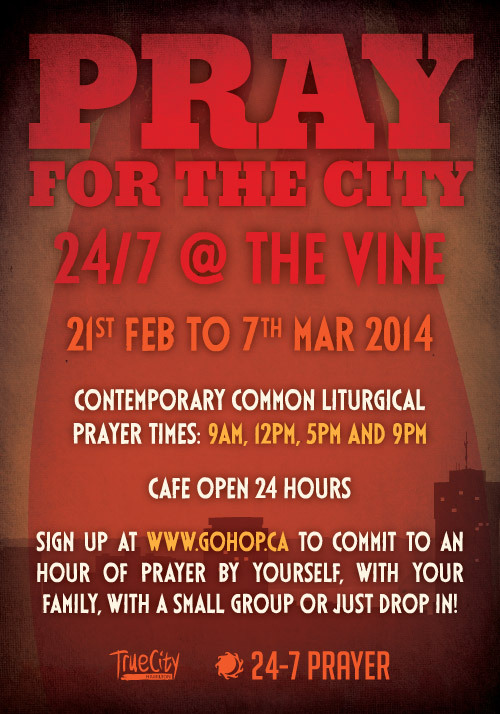 Join us for two weeks of continuous prayer night and day at the Vine from Feb 21st to March 7th following the True City Conference. The Theme for this year’s conference is “A Tale of Two Kingdoms”. Together we are sharing stories of how the Church (that’s you!) is subverting the empire of the world and welcoming God’s reign in our city. Imagine this: a space where you can come by yourself or with friends, pour yourself a hot drink, and settle into a small table or a couch in conversation or with a book. Imagine now that it’s a free space, and that it’s open 24 hours a day, for two weeks straight. Enter, The Vine Cafe. If you find a friend in the prayer room (which often happens) or are meeting to pray with your small group, now you can stay and chat without distracting others seeking solace. Just a few feet from the prayer room, you can bring friends in to the space for a drink and to let them check out the space. We’re excited. We love that people who don’t usually find time for prayer in their schedule feel drawn to the prayer space at the Vine. We want to celebrate this further by introducing a rhythm of common prayer throughout each day. We will be following the daily liturgies from the Northumbria Community at 9am, 12pm, 5pm, and 9pm. Inspired by Celtic Christianity and living with vulnerability and availability. Common prayer will range from five minutes to fifteen, and will be marked by a small bell five minutes beforehand. If you’re searching for God in a world addicted to noise, distractions, and hurry, open our door and breathe deeply. Find friends. Find peace. Find God. Sign up at http://www.24-7prayer.com/signup/ca9a0b to fill an hour of prayer by yourself/with a friend/with a group.